By the way, how did you achieve such an interesting shape of the muffins? Did you bake them not using a muffin pan? 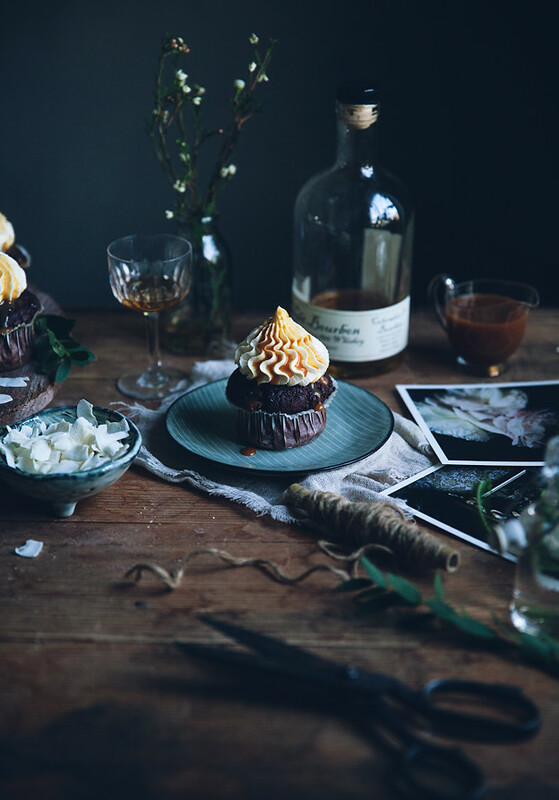 This cupcake looks amazing, pictures are so pretty! 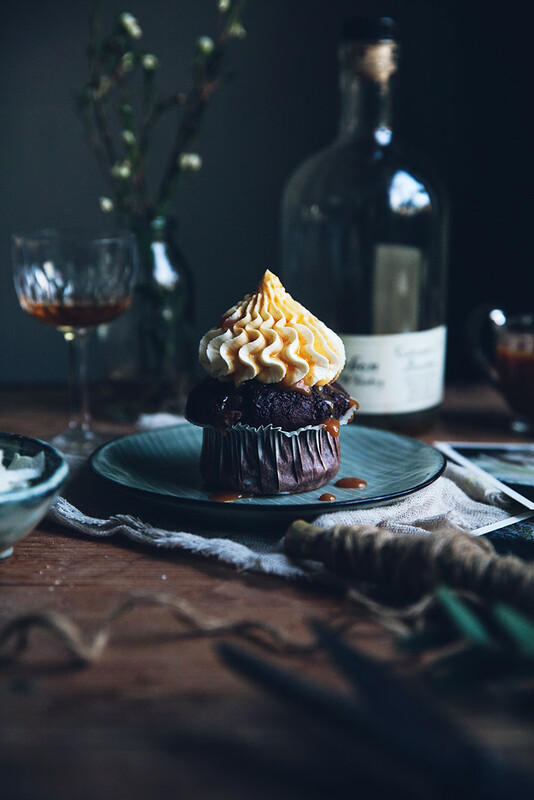 I must try the bourbon caramel sauce – and am I glad you mentioned it would work with rum too!!! – as I have been on the lookout for a great and easy caramel sauce for quite a while now. Oh my yum! These photos are gorgeous! These look insanely fabulous! I love that floofy, whimsical shape 🙂 Happy new year, Linda!! Oh lordy, these look incredible! Where can I get those adorable cupcake liners? Your photography is just stunning! I love the Bourbon Caramel Sauce. What a beautiful treat. Not only do these look amazing but the photography is absolutely impeccable. You are so talented at creating such a beautiful moody and dreamy scene. Dang, these are some gorgeous muffins!! Looooove that frosting! I never thought about mascarpone frosting, but I must try it out next time I bake! I swear I die everytime you post a photo of these bad boys!! yum, they look & sound amazing! Oh Linda, gorgeous and delicious cupcakes! Love everything, chocolate and banana best ever combination. bourbon flavor in desserts is amazing, definitely I'll try in the caramel sauce. Thanks for share these divine cupcakes! 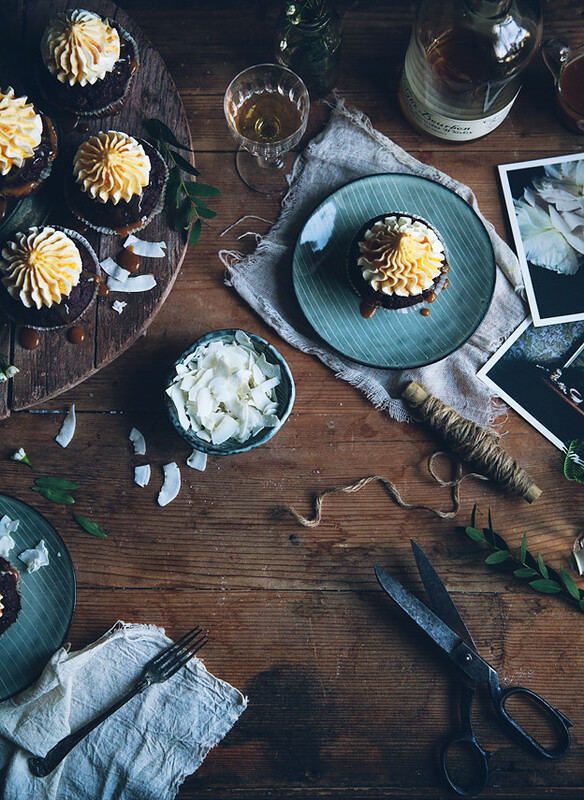 Nice photos – but why do you show 'fail' cupcakes?? What exactly makes them "fail" if I may ask? they look amaxing! I love the tone of your photos too. Too good for words. Way too good. your images are beautiful as per usual, and I am LOVING the shape of that first cupcake – couldn't be cuter!! 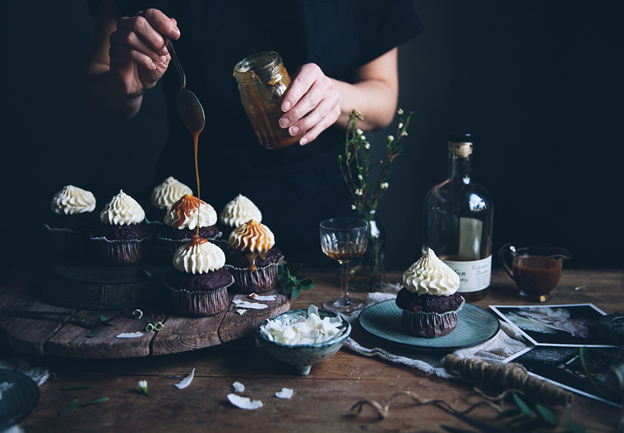 i, too, enjoy a slightly savory icing and the addition of your bourbon caramel is stunning. Today I baked these gorgeous muffins and they tasted amazing. But before serving, I stumbled on a problem – the bourbon caramel sauce. I took the jar with cooled sauce out of the fridge but I couldn't pour it in any ways, the sauce was rock hard candy caramel. Do you have any ideas what went wrong? I'm guessing your sugar simply became too hot. Thing is, I actually didn't use a candy thermometer when making this but I'm guessing mine was about maybe 160°C. Usually when I make caramel the temp is around 170-175°C. 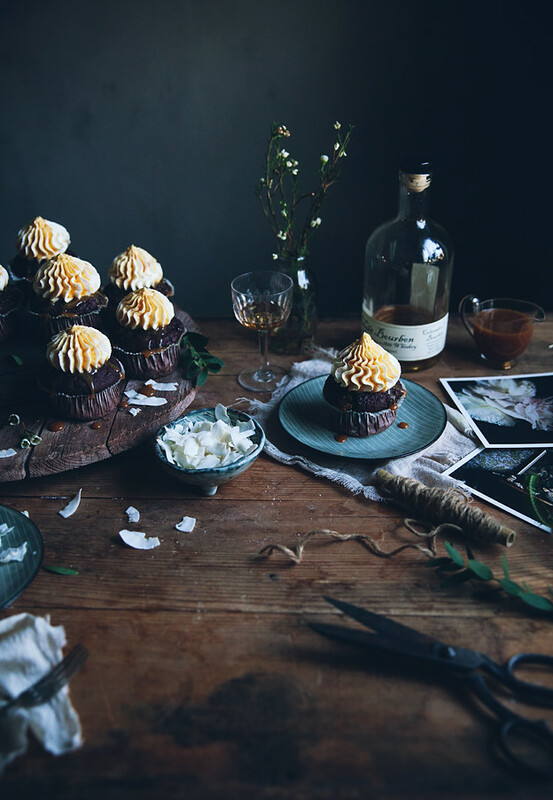 You can totally skip putting it in the fridge before pouring it over the cupcakes. As long as it's room temp! Mine was almost too loose so I had to put it in the fridge for a couple of hours. Hope you succeed better next time! Linda- I live your blog! I made your double chocolate muffins according to the recipe you posted for the DIY Xmas gifts. It calls for 1 3/4 c cocoa powder, whereas this recipe calls for 3/4 cup. I think the Xmas recipe must be wrong because my muffins turned out super dry with a powdery texture. I'll try making these muffins again according to this posting. I'm sure they'll turn out scrumptious! Thank you for sharing with us. Oh no, I'm so sorry Sheila! Going to fix that straight away! that sounds amazing. and looks amazing! those photos are absolutely stunning! Yummy!! Everything beautiful as usual! And I like the muffins' shape very much!!! Very beautiful cupcakes! Linda, i don't have buttermilk, there isn't buttermilk in our magazines. So what can I use in this recipe instead of buttermilk? May i use kefir (a fermented milk product similar to yogurt)? I am already looking forward for your new book to arrive in English. Until then I will have to bake these gorgeous cupcakes. You always get me with dark chocolatte! Love it. Wow, sounds and looks delicious! Love your photography! 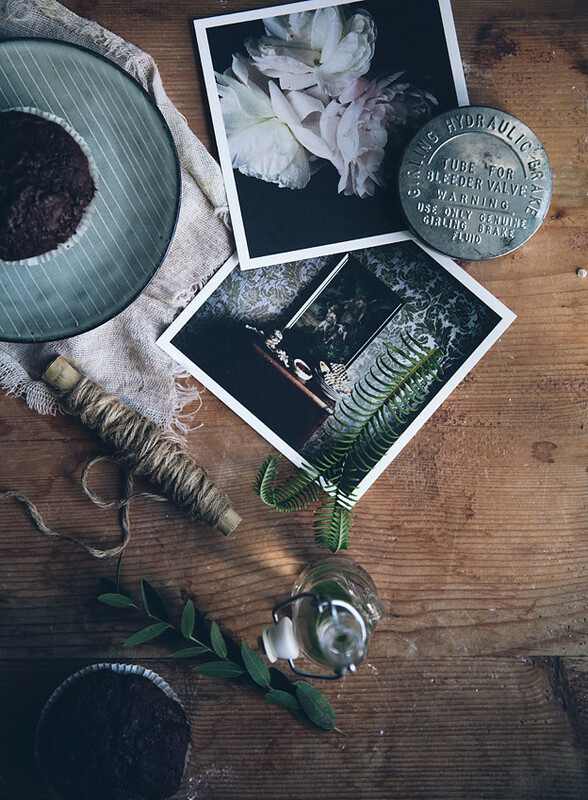 Recipe looks great – photos are stupidly awesome – you are one very VERY talented lady!! Your work is truly beautiful! I always look forward to your next instagram post too, love the pics and beautiful recipes! This is an excellent muffin recipe Linda! I've made them today and they are heaven! I am so making that bourbon caramel sauce! That on vanilla ice cream sounds like heaven. Hej linda! Jag är medveten om att detta är väldigt orelevant men jag hoppas verkligen du svarar ändå! Jag ska baka dina nutella cookies från sweet food and photography, men jag undrar om jag ska platta till bollarna(kakorna) innan jag gräddar dem? Eller blir dem kompakta om jag plattar till dem? Jag är rädd att om jag inte plattar ut bollarna så flyter kakorna inte ut, men jag kanske har fel? Hej Ellen! Nu har jag inte boken i närheten, men om det inte står att du ska platta till bollarna så ska du inte behöva göra det 🙂 Annars kan du alltid provbaka en kaka först för att se hur den blir efter gräddning. Så brukar jag göra när jag känner mig osäker! Kram och lycka till! 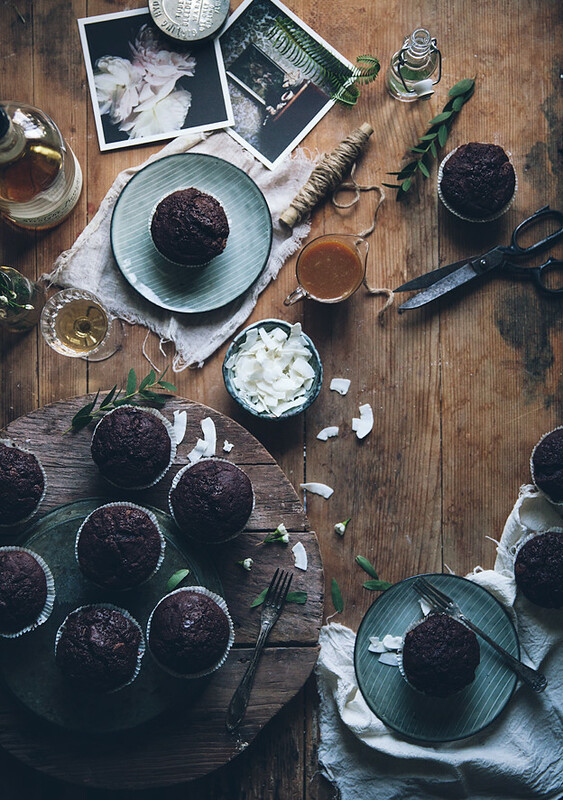 These muffins look divine! I can't wait to try out this recipe, and I'm 100% sure that I'm going to love them. Banana muffins are my favorite, and you can't go wrong with chocolate! These are very delicious looking muffins. Okay, so I'm IN LOVE with your photography first of all. (: And these muffins look unbelievable. That frosting sound amazing on a spoon please and the shots of the caramel are killing me. Gaaah. Pinning! How did you achieve this icing technique? I Must try these, they look amazing (as all of your desserts)! thank you for all of this : the photos are wonderful and the desserts. . I have jus found you blog and it is wonderful… I have looked back at a few of your other recipe's and wondered if you could tell me what the weight measurement is dl ? Hey, I live in Denmark and it´s not possible to get heavy cream, so I was wondering if it´s possible to use heavy cream or normal whipping cream? Or maybe mix those two? Btw your blog looks so delicious and what beatiful pictures!!! This is simple stunning, what lovely shots with a beautiful mood. I have been baking through your recipes and loved them all so far but THIS IS SIMPLY DELICIOUS. It is so soft and fluffy and exactly what I expect chocolate muffins to be. Thank you very much! Also, your pictures are beautiful – it is a perfect combination – good food and good art :-). This is a late comment, I know, but I made these last night–the muffins, frosting, and sauce–and they’re marvelous together. I will be using this caramel sauce recipe for many desserts. Thank you for helping me look good! And, thank you for providing weight measurements.